When Ellen Penafiel adopted Shiloh, she wasn’t concerned that the part Bernese Mountain Dog was so much smaller than the other pups in her litter. “I joked to my kids that she was going to be like Clifford the Big Red Dog,” she says, referring to the classic children’s book, in which the runt grows to be 25 feet tall. But the puppy’s size signaled that something was seriously wrong. Within six months, Shiloh was vomiting, drooling and acting agitated. 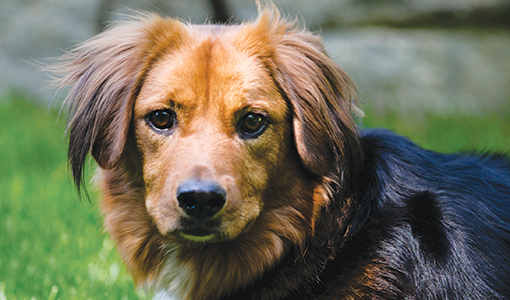 A veterinarian in Boston diagnosed her with a liver shunt, a birth defect that occurs when a blood vessel important for liver function does not close, affecting the organ’s ability to process nutrients and filter toxins. As liver function deteriorates and toxins build up in the bloodstream, dogs can experience stunted growth, excessive salivation, vomiting or diarrhea. They also can suffer from dementia, blindness or seizures and eventually die. Shunts that occur outside the liver often can be corrected with abdominal surgery. But Shiloh’s shunt was in the liver, where surgery can be risky. The dog was referred to John Rush at Cummings School, the only veterinarian in New England who treats liver shunts with a new less-invasive procedure. Using real-time X-rays of the liver to guide his work via a catheter, Rush inserts a special mesh stent, along with metal and fiber coils, to promote blood clotting and reduce blood flow through the shunt. The combination of stent, coils and blood clots creates a dam that directs the blood back where it belongs.